A few kilometres north of Bad Kreuznach the Guldenbach stream flows out of Hunsrück into the Nahe River. It is numbered among the "steepest" streams, for between Rheinböllen and Stromberg it falls from a height of 160 metres down to 8 km. Its headwaters, cut deeply into the mountains, traverse one of the central areas of the Hunsrück iron ore reserves. The historic Rheinböllen Ironworks, form the border between Soonwald ("Soon Forest") to the west and Bingerwald ("Binger Forest") to the east. 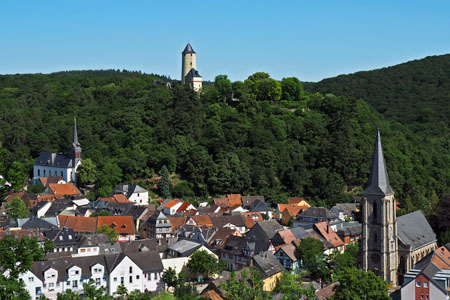 The most famous place in Guldenbach Valley is the village of Stromberg at the foot of Soonwald. Here on the most picturesque elongated mountain spur in the country, stands Stromburg Castle, one of the oldest castle complexes in Hunsrück. This is the home of the "German Michel", Hans Michael von Obentraut (1574-1625), one of the most dashing captains of the Thirty Years War, around whom have collected various stories. He is not to be confused with a ridiculous figure by the same name, a clumsy oaf with a pointed cap and knee breeches. This "German Michel" was created after the German Reformation as a political character to personify simple-mindedness and an easy-going ponderousness in order "to awaken" the people. Stromburg Castle was most likely built before the 10th Century. The first documented reference, however, dates from 1056, when nobleman Count Bertolf named himself after the castle. In 1116 it was razed to its foundations by the Archbishop of Mainz, Adalbert I; although it was later rebuilt. Due to the castle's preservation, the village of Stromberg, first mentioned in 1344, spread further into the valley. During the Thirty Years War (1618-1648) Stromburg Castle was captured and occupied, although never substantially damaged. It was during the course of the Orlean Succession War that it was blown up on 3 March 1689 by the French army and the village itself lay in debris and ashes. Between 1977 and 1981, with the assistance of the regional authority with responsibility for historical monuments, a part of the castle ruins, was reconstructed and incorporated into a modern hotel complex. The importance of Stromberg lay in the presence of Raseneisenstein limonite and goethite, which could be extracted in this Hunsrück region in opencast mining. The ore, with an iron content of on average 25-30%, was not very profitable, but other elements crucial in the refining process were readily available in Soonwald; charcoal, the hydropower of the Guldenbach stream, as well as lime, essential for the smelting process. This lime is so plentiful in the Stromberg lime stone quarries that it was also supplied to the other Hunsrück ironworks, in particular to the "Rheinböller Ironworks" a few kilometres away. The picture above is taken from the terrace of Castle Gollenfels looking across the narrow Guldenbach valley towards Stromburg Castle. Castle Gollenfels was supposedly built in the 10th or 11th Century as a precursor to Stromburg, and since 1156 has been administered by the Rhineland-Palatinate. It was destroyed in 1614 by Spanish troops, but was rebuilt a few years later (around 1619).